Figure 8: for Chapter 8. As previously stated, when Joseph Smith left Quincy on the 18th and started back for Commerce, he probably rode out of town totally unaware of the Matilda Spalding Davison article which appeared in that afternoon's edition of the Quincy Whig. Upon his arrival the next day at the still tiny Mormon headquarters he probably had nothing but good news to report from his trip down into Adams County. Meanwhile the Saints back in Quincy had seen the incriminating article in that Saturday's newspaper and by Monday, at the latest, a copy of the latest Whig was certainly on the road up to Rigdon and Smith. Perhaps by then a copy of the Boston Recorder or some other eastern paper carrying the widow's statement was also well on its way to the Mormon leaders. The following week could not have been a happy one for them. Not only did they now have political and religious fires needing extinguishing in western Illinois, those same kinds of fires were no doubt already spring up all over the eastern mission fields of the Church. Something had to be done quickly to stop the spread of these threatening flames. No record survives to tell exactly when it was that Rigdon and Smith first saw the Matilda Spalding Davison statement in the Quincy Whig. This was obviously not a matter which the Mormon leaders discussed openly with the small band of their followers who were beginning to congregate around the little hamlet of Commerce. Thus, any attempt to reconstruct their actions and reactions in late May, 1839 must necessarily involve a certain amount of guesswork. It is entirely possible that the Matilda Spalding Davison statement did not reach the Mormon leaders until nearly the last week of the month. And it is perhaps even possible that the Smith brothers knew little of the matter or for some other reason left it in Rigdon's hands when it first came to their attention. All that can be said with any confidence about the sequence of events is that by May 27, Sidney Rigdon was writing a scathing reply which he intended to see published as soon as possible in the Whig. "A pious lie, you know, has a great deal more influence with an ignorant people, than a profane one." Sidney Rigdon, May 27, 1839. Of course this whole question of Book of Mormon origins and Rigdon's purported secret involvement with the bringing forth of that book (as well as his alleged role in very the foundation of Mormonism itself) was no new threat to the Latter Day Saints. Sidney Rigdon and Joseph Smith had faced essentially the same charges back in Kirtland, Ohio between 1832 and 1837 and they had there succeeded in sidestepping any slings and arrows which could have wrought permanent damage to the Church and its leadership. In Ohio the whole problem appeared to hinge upon one or two bitter apostates from Mormonism allying themselves with the resident anti-Mormon forces to invent and publish "moonshine stories" saying Sidney Rigdon had compiled the Book of Mormon from the writings of some dead clergyman. These traitorous tales may have been temporary irritants for scripture-thumping Mormon missionaries wandering the southern shores of Lake Erie in days gone by, but they posed no lasting peril to the "chosen people" -- or so said the priests of the Church of Latter Day Saints. However, this new accusation so conscientiously passed along by the champions of candor at the Quincy Whig was quite a different matters. This was no witches' brew served up by recreant backsliders cut off from the "one true church;" this was the purported statement of an elderly and godly lady held in esteem by the Congregational Church. This revered dame of seventy summers seemed an unlikely foe of the Saints; sitting in her tidy parlor in southern Massachusetts and reminiscing about her late and reverend husband, the chronicler of wonderful old legends. But, just because such a prim old grandmother was an such unlikely perjurer, she was all the more an inherent menace to the firm of Sidney Rigdon & Associates, Ltd., purveyors of gilt-edged holy books extraordinaire. Now the press of Bartlett and Sullivan was informing everyone from Governor Carlin down to the ticket-takers at the ferry dockside that this respectible old widow's husband was the original biographer of fictional old Prophet Mormon himself. Here was a new and dangerous challenge to their authority which the churchly brethren could afford neither to ignore out of hand, nor to combat with the second-rate sneers generally reserved for their apostates. This matter demanded Rigdon and Smith's immediate attention and their most consummate skill in defending the faith. Yet the erratic Great Baptizer and his clairvoyant chief seemed strangely unable to rise resplendently to the critical challenge now before them. "Lies become holy things in the hands of such excessive piety." The means which Sidney Rigdon used to meet the challenge facing him in the columns of the Quincy Whig were very questionable methods indeed. In looking over the visible artifacts of his piece of work from today's vantage point they appear utterly inappropriate and also totally insufficient to neutralize the threat posed by Solomon Spalding's widow. However, it may be that the vulgar rebuttal Sidney sent flying off to the Whig offices was only one piece of a larger pie he had cooked up. If so, and if those other, unrecoverable pieces of his work helped him accomplish his intended task, perhaps the tone and content displayed in his letter of reply may be rendered somewhat more intelligible. Still, the Mormon preacher's initial counter-move in defending both himself and his religion seems to be such a blunder that the question might well be asked, "was Sidney Rigdon in his right mind when he wrote his rejoinder to the Whig on May 27, 1839?" "In order to give character to their lies, they dress them up with a great deal of peity..."
Rigdon's Rude Remarks: or, "negroes who wear white skins"
Actually, Whitsitt was not strictly correct in his claim that Rigdon had been totally silent in public since the publication of Howe's book, not "daring anywhere to commit a reply to print" to the claims printed by Mr. Howe. In fact, much of the content of Rigdon's letter of May 27, 1839 bears a strange resemblance to another letter printed just the year before by the LDS Church's own official newspaper. But Whitsitt's observation, that Rigdon had been given "an opportunity... to deny something," is right on the mark. While Rigdon had doubtlessly been in Pittsburgh many times in his youth, he almost certainly had never been employed by either the Rev. Robert Patterson, Sr. or his brother and business partner, Joseph Patterson. Jr. That much Rigdon could deny with impunity, as loudly as he cared to broadcast it from the housetops. As for neither of the Patterson brothers ever owning a printing office in Pittsburgh, so long as Rigdon lived withing walking distance of the town; that was a bit of a fib in the mouth of the Mormon. Robert Patterson, Sr. was for a lengthy period of time engaged in printing and selling reading matter in Pittsburgh. In some years he may have contracted a printing press rather than own one. In other years the press may have been directly under his control and located within a stone's throw of his office desk. Depending on which years between 1812 and 1825 Rigdon cared to admit being in Pittsburgh, his hair-splitting over Patterson's having a "printing office" may have been more or less believable. At any rate, Patterson knew Rigdon, Rigdon knew Patterson, and neither of the two ever said Sidney ever drew a salary from the Pittsburgh bookman. The Great Orator of the Western Reserve could orate with justified, self-righteous indignation that he had never, ever "frequently stated" that he had been connecetd with Patterson's bookish operations. While writers like Whitsitt might argue that this text, appearing in an editorial notice "To the Subscribers of the Journal," says nothing of Rigdon or the Spalding claims for Book of Mormon authorship, a closer inspection of its contents and concerns will tell differently. While it is possible that Elders' Journal editor, Joseph Smith, wrote the above lines about "negroes who wear white skins," apostate Mormons in Geauga Co., Ohio who were supporters of "all kind[s] of abominations, swearing, lying, cheating, swindling, drinking with every species of debauchery," and persons like Eber D. Howe and D. Philastus Hurlbut, "the basest of mankind," it is just as likely that Smith delegated the writing of these particular sentences to "high-faluting Sidney Rigdon," Smith's old mentor and a man who well knew his way around all the ins and outs of bombastic rhetoric. And, while the Spalding claims for Book of Mormon authorship are nowhere mentioned here specifically, the demonization of Hurlbut and Howe renders that whole point moot. If this researcher and his publisher companion were "the basest of mankind," it might well be argued that there was no use in readers (Mormon or otherwise) wasting their time examining the probable lies of anti-Mormons who might do anything under the sun to try and discredit the Church of the Latter Day Saints. This kind of a refutation for the claims of Hurlbut and Howe had made in Ohio may have flown breezily from the Mormon flagpole at Far West in 1838. There Smith and Rigdon were writing and publishing a little newspaper which circulated almost exclusively among their faithful followers. But when Rigdon attempted to hoist this slogan emblazoned banner among the Gentiles of Quincy the following year, it brought only sighs of distaste and embarrassment from the Whig's readers. In his May 27, 1839 letter Rigdon essentially retold the same dirty story about Hurlbut's wife and declared that the man who had first put the Spalding claims before the public was not to be trusted in anything he did or said. Rigdon's equally sinister attempts to assassinate the character of Solomon Spalding and Spalding's widow also fell upon the deaf ears of Quincy's non-Mormon citizens. 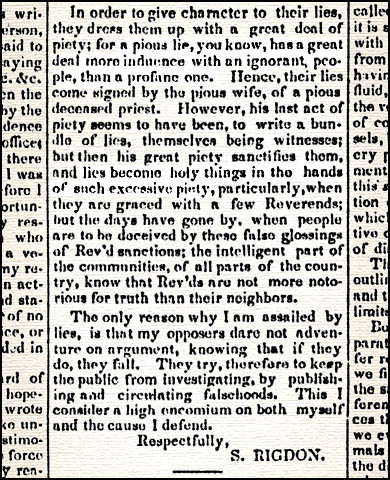 Although the plight of the fugitive Saints had brought forth genuine compassion and charity from the "suckers" of riverside Illinois, Rigdon's demonization of elderly Protestant ladies and deceased Protestant clergyman was not the sort of thing the Quincyites relished reading in their Saturday papers. Could the writer of this vile letter possibly be the far-famed, eloquent spokesman of the Latter Day Saints, the same Rev. Mr. Sidney Rigdon whom Democratic state legislators and governors had praised as being a man of highest honor in their recently composed letters of recommendation to the President and Congress of the United States? Surely something was wrong here! I am told that Rigdon claims to have a mission direct from God, with special powers to preach special and new revelations, for the special purpose of bringing mankind to imbibe the meek and placid doctrines of the gospel, and to usher in the millenium... Now, I ask the candid reader to compare the logic, the sentiment, and the spirit of the article with that of the gospel and he will find that it gives the lie to Rigdon's pretence to a preacher of righteousness. Moreover, it evinces the strongest presumptive evidence that he is guilty of the crime with which he is charged. Mr. Rigdon has sent us a communication intended as a reply to the queries propounded by a correspondent two weeks since... Mr. Rigdon will perceive from a little reflection, that it could answer no good purpose by publishing his communication -- it would of necessity, call forth a rejoinder of a still more uncourteous character... We consider it best... to close the door upon this controversy. But where is President Rigdon, my servant Sidney, always named first in the early revelations of the Lord? Where is the Lord's Messenger and Mouthpiece, the inspired projector, architect and great Messianic feetwasher of the Kirtland temple, the great interpreter of the Nephite, and scores of other records and tongues? He is nowhere... You see him in a poor little office, a log shanty, probably, the Lord's postmaster; but only a postmaster after all. How are the mighty fallen... He was an excellent fellow for expounding the new gospel on Sundays, but he was no practical kingdom-builder, no business-man.... Religion is all very well for the people, but look at the Jesuits; they are men of the world, the friends, and advisers of emperors and kings; that's what we want now -- "mark it, Elder Rigdon."